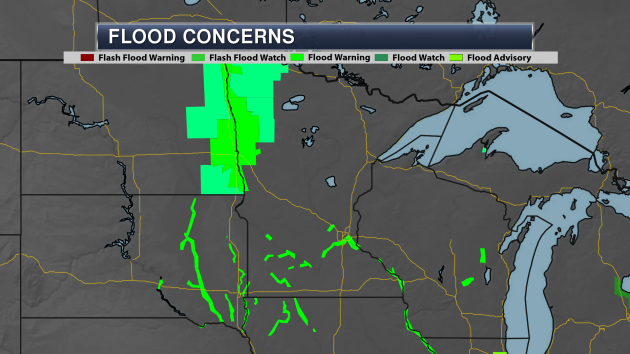 Numerous flood warnings continue across southern and western Minnesota due to the ongoing river flooding across the region. 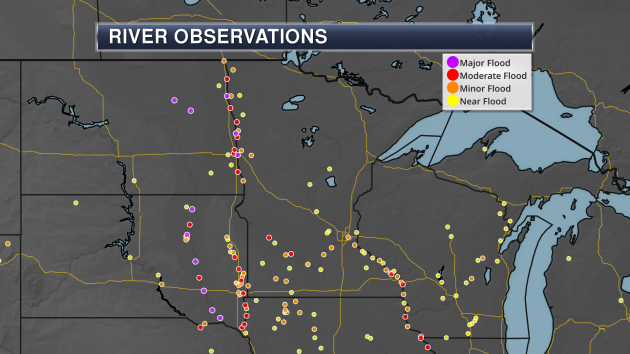 Across southern Minnesota, parts of the Minnesota and Mississippi are still in Moderate Flood Stage, with areas along the Red River in Major Flood Stage. 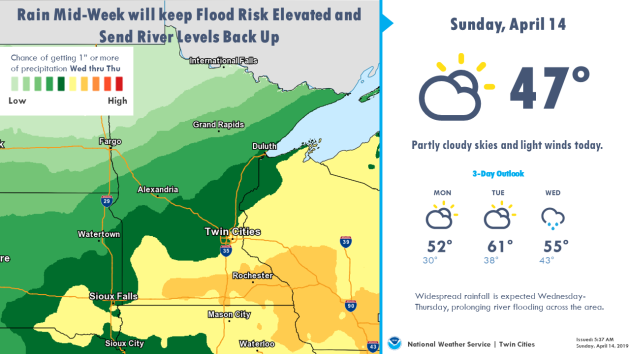 While numerous areas are seeing rivers slowly recede, that will likely change later this week with ongoing snow melt from our recent system as well as a round of heavier rain expected. 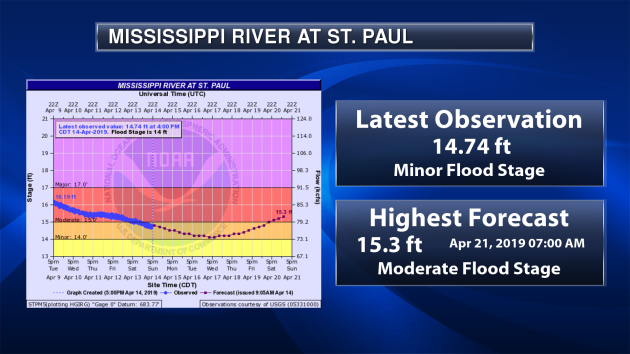 As we take a look at some select river gauges, we'll start with the Mississippi River at St. Paul. Within the past couple days the river dropped into Minor Flood Stage. It will almost drop to Action Stage by the middle of the week before the river starts to climb once again. Next weekend it is expected that the Mississippi River will be back in Moderate Flood Stage. 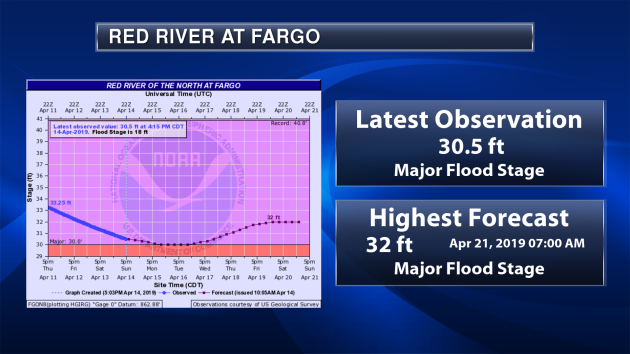 Heading over to the Red River at Fargo, it will drop to around 30ft early in the week but climb back up once again to around 32ft by the end of the week. 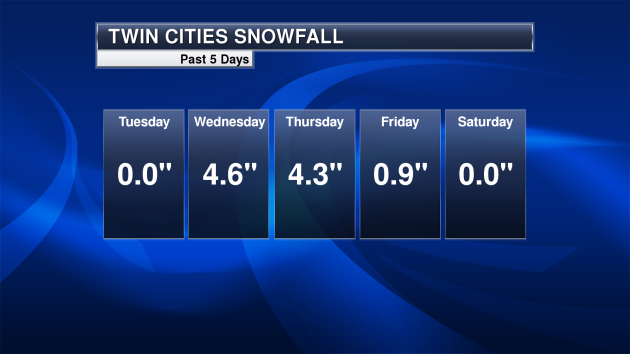 I know we all want to forget the snow that fell last week across the region, but I still thought I would remind everyone and show you the snow over the past five days in the Twin Cities. 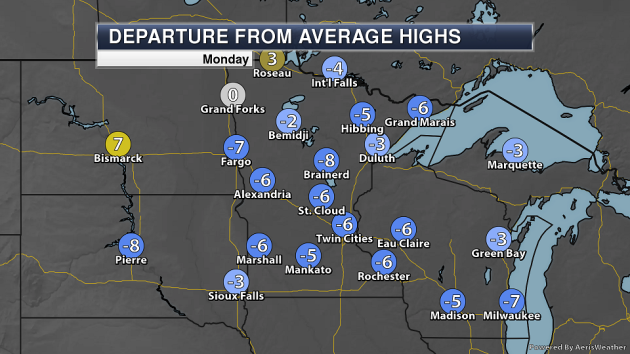 We picked up the most on Wednesday, when 4.6" fell at MSP airport. An additional 4.3" fell on Thursday, and 0.9" fell on Friday as the system slowly departed the region. Those three days add up to the only measurable snow this month, bringing the monthly total so far to 9.8" of snow at MSP airport. Through Saturday (the 13th), we only average 1.4" of snow in the Twin Cities, meaning we are 8.4" above average. 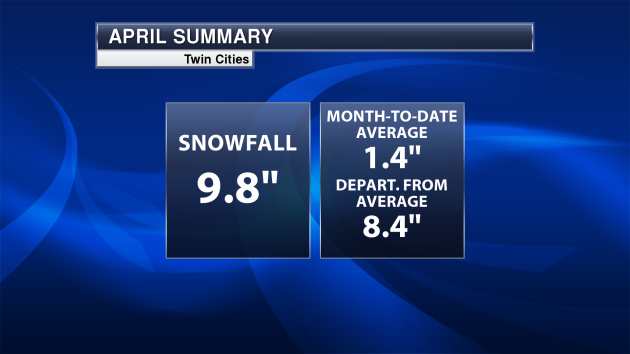 That brings us into a tie for the 10th snowiest April on record, which also occurred in 1984. 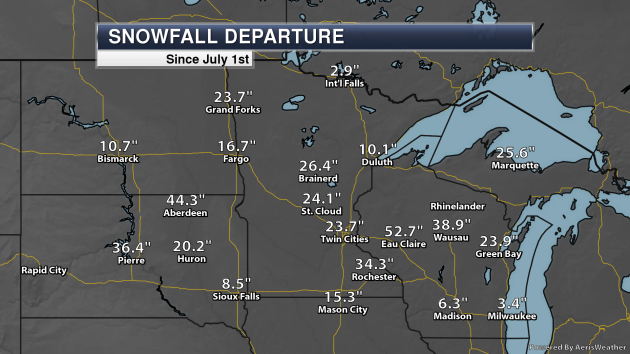 As we take a look at snow across the region at climate sites so far this month, some areas of South Dakota and Wisconsin have received over a foot of snow. Just about all the climate sites across the region on our map are above average through the first 13 days of the month - the main exceptions being Mason City, Milwaukee, and Marquette. For the entire snow season, the Twin Cities has received 77.1" of snow, 23.7" above average and good enough for the 11th snowiest on record. Amazingly, 10th place is the 78.3" of snow that fell last winter. 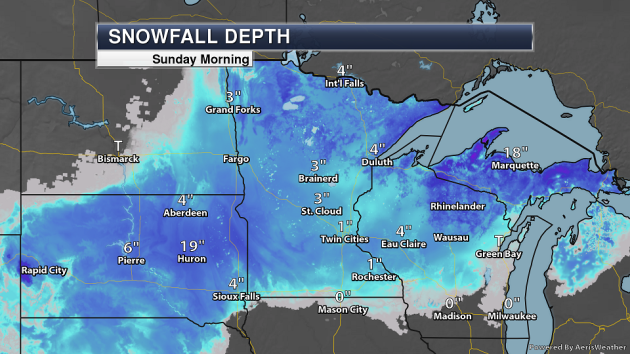 The snow depth was down to 1" Sunday morning at the Twin Cities airport, melting away 2" of snow Saturday. Other area reports showed that Eau Claire had 4" on the ground, with 3" in St. Cloud. 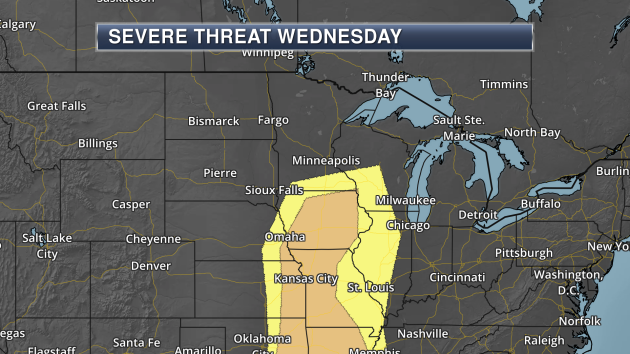 As we head toward the middle and end of the week, another strong storm system will move out into the central United States on a similar track to the one that moved through last week, bringing us precipitation across the Upper Midwest and Minnesota. A big difference between this system and the last one will be the temperatures - we'll be in the 50s for highs this time vs. the 30s last week, meaning that this will be in the form of mainly rain (with maybe a little mix-over Thursday Night into Friday).. Models are indicating the potential of at least 1-2" of rain across parts of southern and eastern Minnesota through the end of next week, which will help keep the river levels elevated across the region. 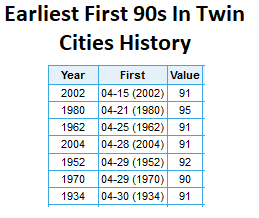 No 90s are in the forecast for the Twin Cities anytime soon, but Tax Day marks the earliest first 90F day in Twin Cities history. That was back in 2002, when the thermometer hit 91F. A even more "fun" stat: six days later (on the 21st) 6.6" of snow fell, followed by another 5.5" on the 27th. Just because we hit 90F doesn't mean winter is over... which I think we all clearly know here in Minnesota! One thing about Minnesotans: we don't take a nice spring day for granted. Ever. Not after a winter with 77 inches of snow at MSP. If anyone asks (doubtful) 30-year average snowfall in the Twin Cities is closer to 54 inches. Last winter saw 78 inches of powdery goodness (26 inches of that fell in April of 2018), almost making up for 2017 (32 inches), 2016 (37 inches) and 2015 (32 inches). In recent years, when it comes to snow, it's feast or famine. Not much in-between. Snow melt accelerates today as highs top 50 degrees; clouds building as the day goes on. Spring Fever Flu may be a thing on Tuesday as temperatures rise into the 60s. Much of the 9.8 inches of snow that fell should be gone by Tuesday evening. After a mercifully-dry March (taking the edge off of Minnesota's river flood threat) it appears we are heading into a wetter pattern. A significant storm may dump a couple inches of rain the latter half of the week; ECMWF guidance hints at a slushy ending Thursday night or Friday. Try not to panic - 60s return again next weekend. MONDAY: Clouds increase. High 52. Low 38. Chance of precipitation 30%. Wind SE 10-15 mph. TUESDAY: Mix of clouds and sun, pleasant. High 62. Low 47. Chance of precipitation 20%. Wind NE 5-10 mph. WEDNESDAY: Heavy showers, risk of thunder. High 58. Low 40. Chance of precipitation 90%. Wind SE 10-20 mph. THURSDAY: Heavy rain may end as slush. High 43. Low 38. Chance of precipitation 90%. Wind NE 15-25 mph. FRIDAY: Rain or sloppy mix lingers. High 45. Low 35. Chance of precipitation 80%. Wind N 10-20 mph. SATURDAY: Peeks of sun, mercifully milder. High 62. Low 45. Chance of precipitation 20%. Wind NW 8-13 mph. SUNDAY: Stray shower or T-shower. High 64. Low 47. Chance of precipitation 50%. Wind SW 5-10 mph. 2002: An early heat wave overtakes Minnesota. 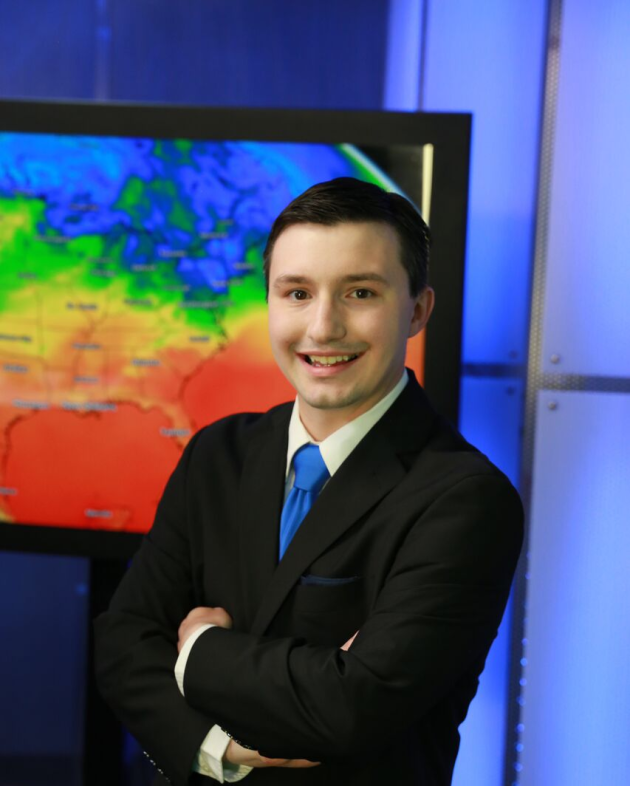 Faribault hits 93 degrees, and the Twin Cities would experience their earliest recorded 90 degree temperature with a high of 91. A weak system passing through the region Monday will bring mainly cloudy skies and a chance of a mix of precipitation early in the day, changing over to rain as temperatures warm. The best chance of precipitation during the day will be in northern parts of the state, with rain possible for areas like Rochester by the evening hours. 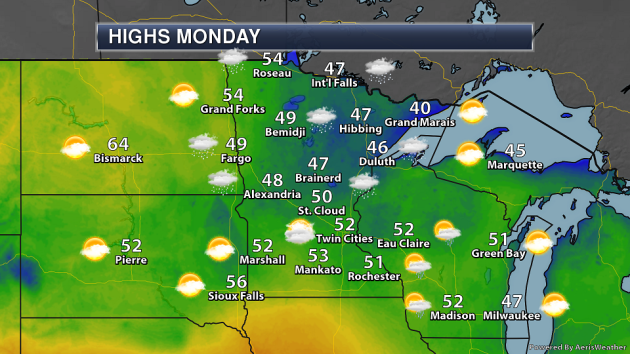 Highs will be in the 40s and 50s across the state. 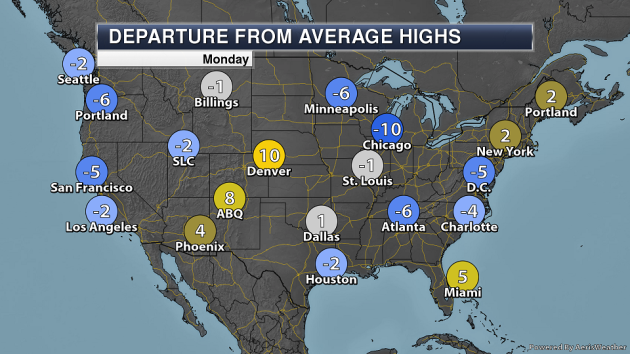 In most areas, highs will be below average on Tax Day Monday, up to about 10 degrees below in spots. Temperatures will be a little up and down this week. After highs in the 50s Monday, we shoot up into the 60s Tuesday before that mid-to-late week system bring rain in Wednesday and Thursday, helping to knock temperatures back into the 50s. We'll climb back into the 60s for the weekend, with cooler temperatures returning once again next week. 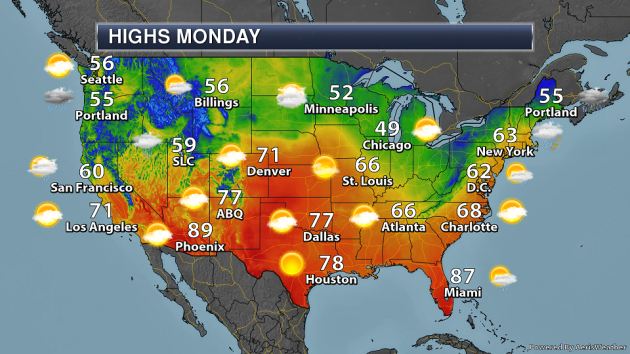 As you finish up your tax returns Monday, an area of low pressure will be moving through the Northeast, bringing some rain and storms along with it including early in the day for the Boston Marathon. 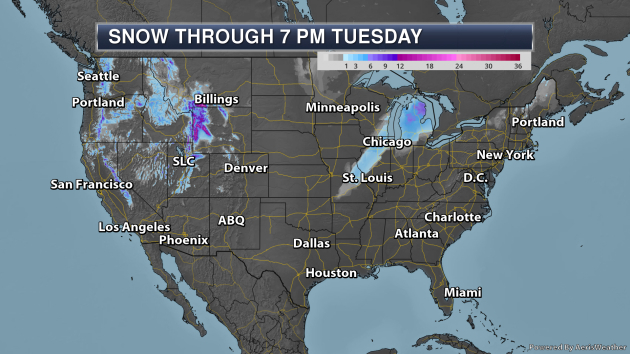 A weak system moving through the Upper Midwest will bring some light rain/snow showers along with it. Meanwhile, a system approaching the Northwest will bring rain and higher elevation snow to the region. 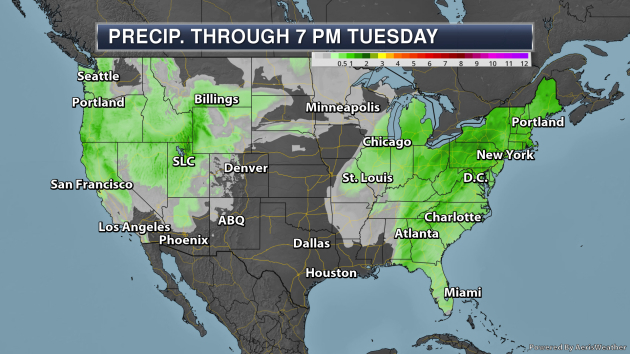 Through Tuesday, some areas in the eastern United States could pick up over an inch of rain as a cold front and area of low pressure move through the region. Parts of the Pacific Northwest could also receive over an inch of rain. The heaviest snow will fall across parts of the western mountains, where at least a foot of snow could fall in some locations. Some additional snow will also be possible in parts of the Great Lakes. More from NOAA: "It came as a surprise: A series of large waves rolled into New Jersey's Barnegat Inlet seven years ago, dragging a group of divers up and over a breakwater. According to local news reports, the waves then crashed into a jetty where they knocked people into the water, causing injury and property damage. Eyewitnesses reported seeing waves as high as 6 feet. But how? There had been no earthquakes or underwater landslides in the area. NOAA scientists determined these waves were part of a meteotsunami, a small, weather-driven tsunami caused by changes in air pressure created by fast-moving severe thunderstorms, tropical storms, squalls or other storm fronts. The waves that hit New Jersey were generated from an intense, offshore squall line known as a derecho and were detected by more than 16 NOAA tide gauges along the East coast." More from the Phoenix New Times: "Even though the roller-coaster negotiations over the Drought Contingency Plan have finally come to an end, Arizona's water problems, which are far more complex than just a Colorado River shortage, are not over. To Cynthia Campbell, they never will be, because managing water in a desert is a never-ending, ever-evolving task, both in cities and throughout the state. "We're sitting in the middle of the desert, trying to grow a city. Which defies logic, for many people," said Campbell, the water resource management adviser for the city of Phoenix. But whatever people think about the sensibility of cities in deserts, she said, the city is responsible for securing diverse supplies of water and ensuring it can move that water wherever it needs to go." More from Earther: "If you’re depressed by the climate politics of Washington, D.C., may I suggest checking out the other Washington. On Thursday, the state legislature officially passed one of the most ambitious clean energy bills in the nation. Washington is now committed to making the state’s electricity supply carbon neutral by 2030 and 100 percent carbon-free by 2045. The bill makes the fourth state to commit to 100 percent clean energy and adds a feather to the cap of Governor Jay Inslee who requested the bill be introduced. Inslee is running as a climate candidate for president that can get things done in the District if elected, and this bill is a very tangible accomplishment he can now point to."